Pastels have been prominent in my wardrobe over the last few weeks (here, here, and here), so I was pretty excited about today's edition of EBEW. You guessed it - pastels. I bought this colorful pastel top for $7 at Target last year and have worn it a ton since then, so for me this top was worth every penny - all 700 of them. Add that in with my J.Crew Factory skirt and DSW shoes and I put together today's outfit for about 10,000 pennies. Not too shabby! Anyhow, check out April's edition of EBEW when you have a chance and post your favorite pastels on the site also. Happy Tuesday! I love all the colors in that plaid top and it looks so cute with those pink shoes! Thanks Sharon! I think everyone needs a pair of pink shoes - they just make everything brighter :-). Hope you have a great rest of the day! Thanks for visiting my blog and commenting! 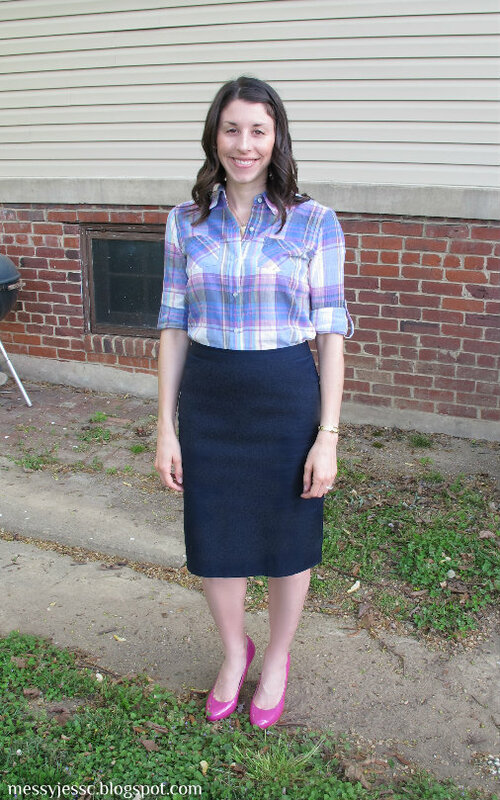 I just got into wearing pencil skirts (a little late to the game, I know), and I really like how you paired a casual, plaid shirt with yours. I'll have to try to recreate something like this in the future. Those shoes are super cute, too!! Thanks Rebekah! Hope you have a great rest of the day! this is one of my favorite outfits, and those shoes are awesome! I love your plaid shirt and the pop of color in your heels! Ah, I love your shoes and your plaid shirt. Stylish and chic!